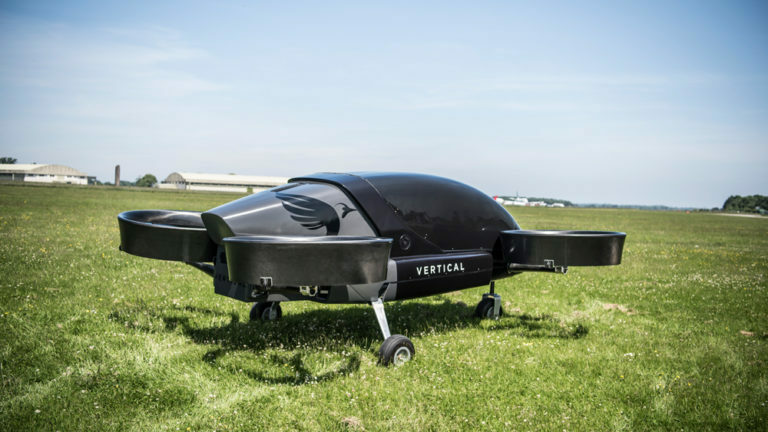 The Vertical Aerospace eVTOL has the body structure of a 'passenger drone', meaning it has a central fuselage with four extremity rotors used for lift and control. It has one of the sleekest looking designs in development, taking inspiration from Formula One racing technology. Vertical Aerospace plans to launch a piloted air taxi service by 2022. Last Summer, Vertical Aerospace flew a demonstrator aircraft (as seen above) at Cotswold Airport in the United Kingdom. Vertical Aerospace is based in the United Kingdom. It was founded in 2016 by the former CEO of OVO energy, Stephen Fitzpatrick. It's team consists of 28 erospace experts from companies like Airbus, Boeing, Rolls-Royce, Martin Jetpack, and GE. Stephen Fitzpatrick is the former CEO and Founder of OVO Energy. OVO provides a wide range of energy services from home climate solutions to electric vehicle charging setups. Fitzpatrick is also the former owner of a Formula One racing team, and believes that technologies developed for Fomula One are even more applicable to aircraft than they are to road vehicles. Capacity: Vertical Aerospace plans to develop multiple different sizes of its aircraft ranging from two passengers to six passengers. Vertical take-off and landing: Uses extremity rotors for both lift and control. It's structure is that of a passenger drone, meaning that it has a central fuselage supported by its rotors. Fixed wing flight: Built to be a short distance air taxi, and so has no fixed wing. Regulation: The 'technology demonstrator' aircraft has recieved certification for flight from the UK Civil Aviation Authority. Vertical Aerospace is currently working with the European Aviation Agency to get flight certification for its next model. Vertical aerospace is uniquely positioned as one of the main eVTOL development companies in the UK. It's demonstrator flight video caught the eyes of many in the industry, and established Vertical Aerospace as well on its way to success. Moreover, VA's team is full of expert members from well established aerospace companies, helping to establish its credibility and bringing expertise as well possibility of additional funding if necessary. Also promising is the progress Vertical Aerospace has made towards certification. Getting approval from regulatory agencies is one of the greatest challenges of developing new aircraft, and Vertical Aerospace has shown it knows how to work with these agencies by getting flight approval for its demonstrator aircraft. We see Vertical Aerospace's greatest hurdle as its lofty goal of launching its flying taxi services by 2022. VA has not yet =announced any outside partners, and building the complete infrastructure for air taxi services within four years may be difficult to do alone.